Sergius Turrianus is an Imperial smith added by the Knights of the Nine official plug-in. After Wisdom of the Ages, he appears at the Priory of the Nine and offers repair services 24 hours a day. 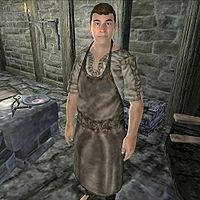 He wears a blacksmith's apron, blacksmith's pants and a pair of russet felt shoes. A personal friend of Sir Thedret, Sergius will show up when you have released his friend from Fort Bulwark and spoken with him back at the Priory. Sergius will then stand near the forge and smithy in the basement and will offer his services at all times, without ever sleeping or eating. When you approach him for the first time, he will explain what he is doing in the Priory: "Sergius Terrianus, at your service. Thedret and I go way back, and he said there was need of a Blacksmith here. It'd be an honor to provide what service I can. So you need anything repaired, you come see me." Though he offers no goods for sale, when you reach expert level in Mercantile you can invest 500 gold with him. There is also a male Imperial in Skyrim with the name Sergius Turrianus. If you want Sergius to appear at the Priory, be sure to talk to Sir Thedret on your next return there after the Wisdom of the Ages quest as his post-quest dialog enables the blacksmith. If this is the last Priory of the Nine artifact collected, on return you will be force-greeted by Lathon and sent on The Sword of the Crusader quest; if it is completed without talking to Sir Thedret, the option is lost and Sergius will never appear. You have a small time frame to avoid the force-greeting. Save before entering the building if you do not have autosave upon entering enabled. Lathon will likely come from the left side and have to navigate around the other Crusaders. Deviate slightly to the right and run up the stairs, as he makes his way up jump from the highest point of the stairs, down to the table and try to find Thedret to engage in conversation. Alternatively, Thedret may be upstairs already and you can avoid having to circle around Lathon. After speaking with Sir Thedret instantly check the basement to see if Sergius is behind the anvil.